Just like painting by numbers makes art easy, artists find safety in numbers. Of course, solitude can produce some great results artistically speaking, but it can come at a price. And we’re not just talking about Van Gogh’s ear. A lot of artists tend to live in urban areas and renting a space to work in can be expensive, especially now that the gentrification effect that a lot of street art is producing is pricing artists out of their own neighbourhoods! Overcoming that paradox can be achieved with the economies of scale delivered by collective life. And it’s not just wallet-friendly upside. Toiling away on your own can be daunting for social and commercial reasons, so joining forces with other artists can keep you sane, allow you to brainstorm, build a name, and even take on commissions together. And that’s just what is happening for Singapore’s preeminent street art collective, RSCLS (affectionately pronounced Rascals). RSCLS is comprised of stylin’ artists with single name monikers like Antz, Zero and Clog2, based out of the Aliwal Art Centre in Singapore’s Kampong Glam enclave. While their individual discipline of choice takes in the typical hallmarks of street art, such as stencilling, murals, and wheat-paste, what they’re spraying and painting about sets Singapore apart. Make no mistake – trying to progress a street art scene on the Little Red Dot, with its rules and regulations, is not easy (just ask Sticker Lady or the artist that recently wrapped an HBD staircase in gold foil about their innocent attempts to amuse, connect and beautify). But since RSCLS has formed, they’ve been able to forge a name for Singapore Street Art, even using restrictions to inform their work. Interested? We’ll be profiling this group of artists over the coming months, kicking off with street art activist and epic muralist, TRASE1. So how does one rascal find another? RSCLS all began once upon a time (call that 2003), when a group of up and coming artists were done with unsolicited attempts to throw up original art on street walls and started getting smart about how to drive the scene forward, and actually make some coin doing it. The Singapore Street Festival had come alive in 2002 (celebrating 15 years this year), and through it members of RSCLS were able to showcase their work. 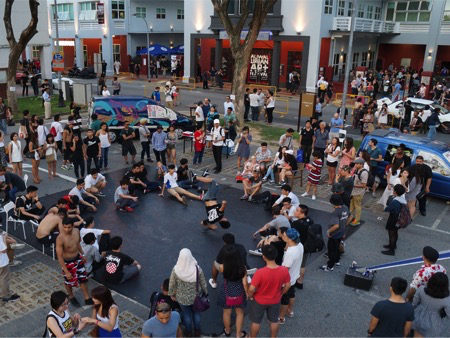 In fact, as they’ve developed, a number of them have been instrumental in leveraging government and no-government bodies to promote street art in Singapore, and been involved in leading segments of the event to mentor and celebrate other artists. What’s next for RSCLS? Well, Mongolia is on the horizon. One of their many initiatives (there’s a book in the works amongst other things), is a reach out programme with various iconic street artists from other South East Asian countries. In establishing a network of artists that embody the nuances of street art in their nation, RSCLS hope to raise the profile of Asian street art, and indeed raise the bar. Their research has led to the discovery that there is quite the Hip Hop scene in Mongolia and their street art brethren, in a land filled with plains and mountains and acres of space, are in dire need of wall space to paint on! So it’s RSCLS to the rescue with a trip in the pipeline to see just how the collective can foster this burgeoning movement. To find out more about RSCLS, stay tuned for our upcoming profiles on each artist.